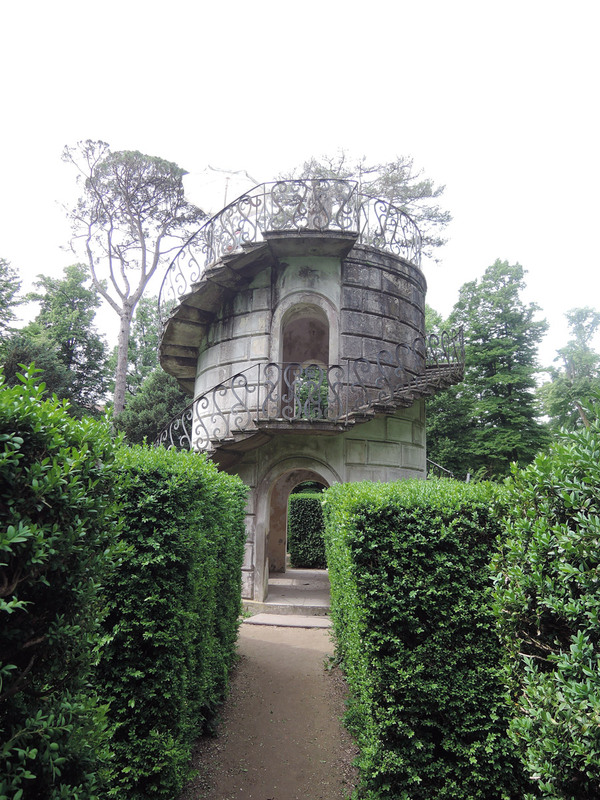 During my last visit to this beautiful villa in Stra I had not the chance to enter the Villa Pisani maze (it was closed) and I was quite disappointed. 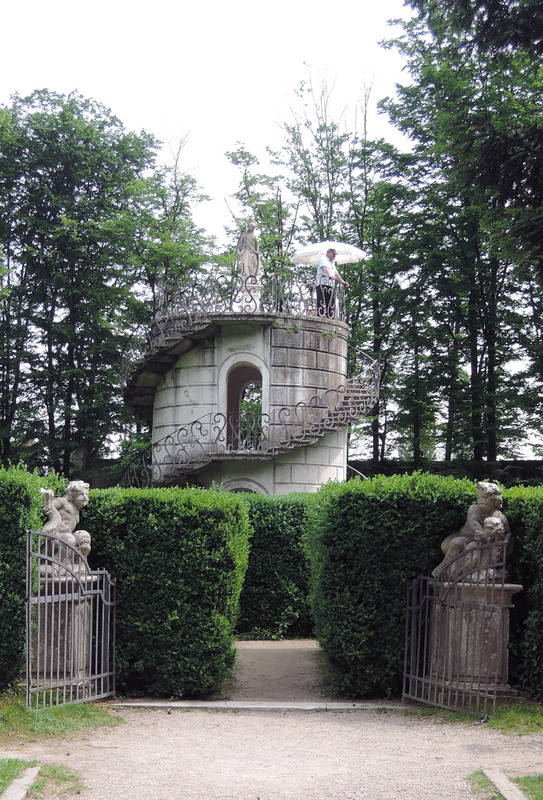 Villa Pisani maze is one of my childhood dearest memories. I remember well how thrilling it had been to get lost in it and finally finding the right way. So I decided to take a second chance. I took my bike and I went from home to Stra along the river bank. I had to pay 7,50€ (Garden ticket only) and I thought: Well, it’s a little expensive to visit only the garden. Besides I do not have much time and I will see only the maze. So it’s a bit of a waste. Plus, let’s face it, at my age I won’t get lost! Surely I’ll find immediately the right way and then I’ll be out in 10 minutes! So I walked towards the right side of the park and I arrived at the entrance of the maze. On top of the central turret was a big man standing. He was giving directions like: You, turn right! … I said RIGHT!! He was the watchman who helps people to find the right way through the maze. According to my childhood memory there was no watchman once. I entered and started walking down the path. 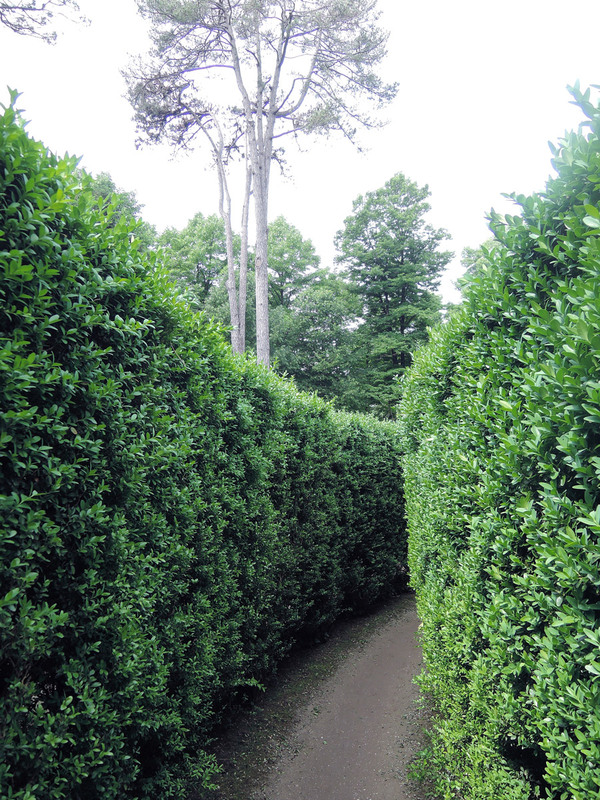 At first the hedge is not very high so you can realize more or less where you are. But then it becomes higher so you lose your sense of direction. “I do not know, maybe 15. But I thought that I would have been already at the centre at this point”. Once up the turret I met the watchman who cheered me. How nice… and funny! Then he started to give indications to a group of school children and their professors. While he was leading them, I spotted the girl I met before, whose name was Daria, and she agreed to be helped to reach the turret. On the contrary, the guardian led the students from the start (without their “permission”) so they came up in a short time. He deprived them of the fun to get lost and find the way on their own. I told him so and he explained that, without a guide, school groups make too much confusion, they separate, and then it is too complicated to lead them. So I was glad I had the chance to reach the turret on my own. The funniest thing was that a group of students had already arrived at the turret when five latecomer professors entered the maze. The guardian was busy giving directions to other people so the latecomer professors got lost. The students obviously enjoyed giving them the wrong directions. Such fun! After a few photos I decided to face the return. But, since I hadn’t much time, I asked the guardian for help. On my way out I met the latecomer professors. They were laughing, so getting lost was probably more fun for them than for their students! 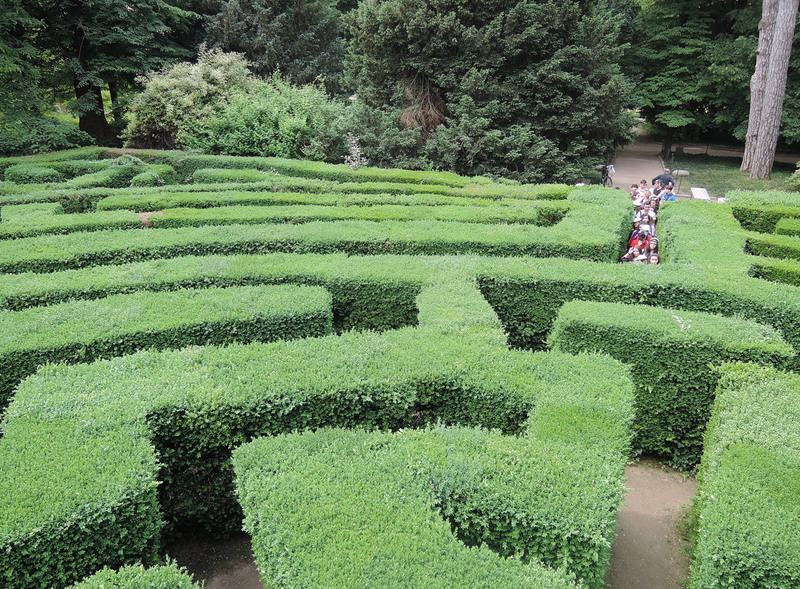 The Villa Pisani maze is one of the 3 hedge mazes survived intact to this day in Italy. On the turret of the maze there is a statue of goddess Athena. It symbolizes the wisdom gained arriving at the centre. I must say, I feel a little wiser. Ah ah! The maze was once home to some sort of amorous game. The ladies waited on the central turret while the gentlemen had to reach them. Before returning home I took a few more photos in the garden. There was a beautiful wisteria tunnel. Unfortunately not in bloom… how nice it must be! Maybe next time! 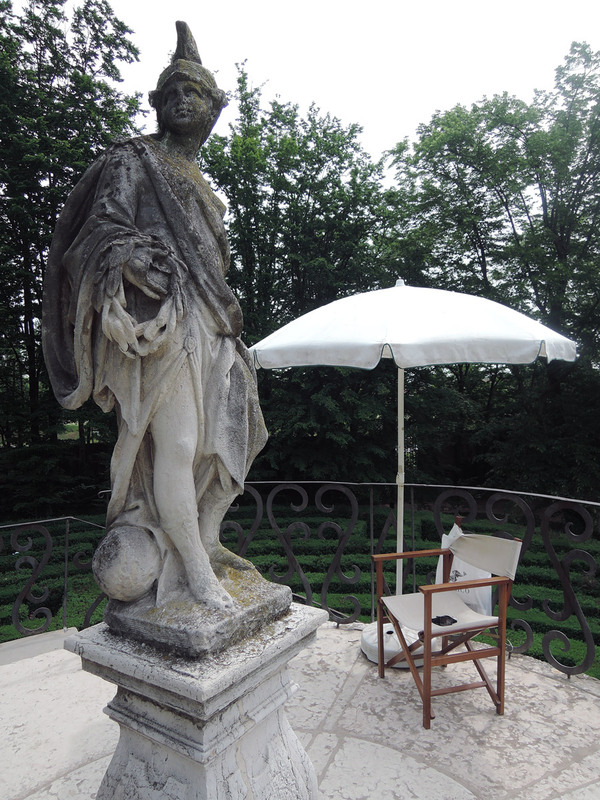 If you want you can read my post about Villa Pisani. The maze is open only from April to September (9 am – 1:30 pm / 2:15 to 7:15 pm ) but it is closed at Easter, Easter Monday and April 25. 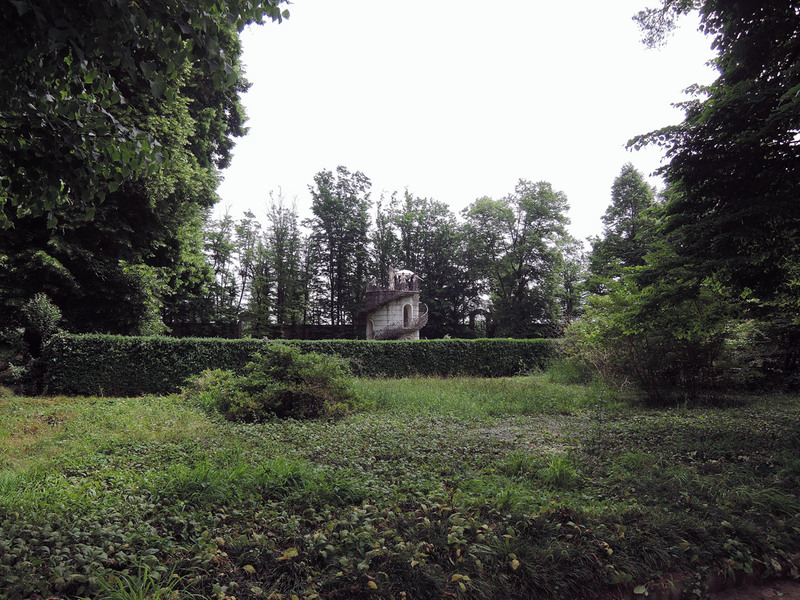 Inside the park, dogs are allowed on leash and muzzle but they are not allowed in the maze. The maze is not accessible for disabled visitors. The maze can be closed in case of bad weather, extermely hot weather or maintenance. Free entrance under 18 years. Free admission every first Sunday of the month. Free admission for women on 8th March. Free entry for EU citizens under 18 years of age.